The Irish Republican Prisoners’ Welfare Association (IRPWA) expressed their condolences to Mr Catney’s family. They said the former Blanketman had been “a tireless worker for the POWs currently incarcerated” and would be sorely missed. Hundreds of republicans from across Ireland attended his Requiem Mass at St Oliver Plunkett’s Church before making their way to Milltown Cemetery. Mr Catney’s remains were draped in an Irish tricolour, with a beret and gloves set on top, as they arrived at St Oliver Plunkett Church in Lenadoon. Outside, the colour party, made up of eight men with their faces covered, escorted the remains to the republican plot. A lone piper led the cortege through the graveyard to Milltown where a minute’s silence was held before a lament was played. The coffin was also flanked by dozens of republicans dressed in white shirts and black ties. An oration written by republican prisoners was delivered by Lurgan republican Paul Duffy. Several PSNI Land Rovers took up position outside the gates of the cemetery after the funeral cortege entered the church grounds, while several more remained out of sight in a car park a short distance away on the Andersonstown Road. On Tuesday night, volunteers fired a volley of shots in tribute to Mr Catney. 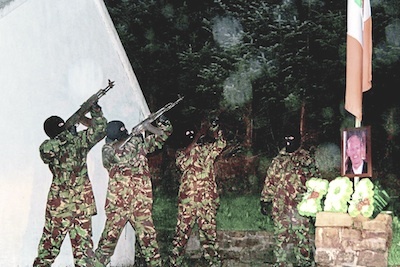 Three of the men fired several shots over a framed picture of the former blanket man, which rested beside a tricolour and a floral tribute spelling out the letters ‘IRA’. A new mural was also painted in his memory at Ardoyne Avenue. After joining the IRA as a youth at the height of the conflict, ‘TC’ was jailed for life in 1974 at the age of 16. He took part in the blanket and dirty protests before being released from Long Kesh in 1990. From the upper Suffolk Road, Mr Catney was a brother-in-law of leading Sinn Fein member Gerry Kelly and had been active in Sinn Fein until 2005. However, in recent years he came to disagree with the Stormont administration and worked with opposition groups such as the Republican Network for Unity and the 1916 Societies. During Mr Catney’s funeral on Wednesday, Fr Brankin spoke of Mr Catney’s human rights work and said that the 55-year-old had fought for “justice for everyone”. Fr Brankin paid tribute to his relationship with his family, his on-going campaign for human rights and his search for justice. “His positive attitude, determination and his focus got him through along with the support of family and friends,” he said. On his release from prison, mourners heard he was “determined to do what he could to help improve conditions” inside. “He always stayed true to his own political beliefs,” he added. However, the comments infuriated unionists, and Fr Brankin later issued an apology for any “hurt and distress” he had caused. 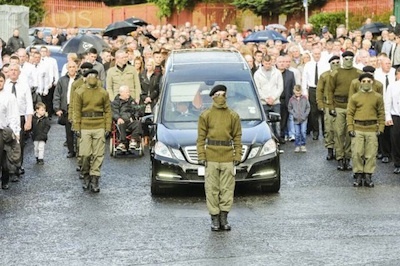 The Democratic Unionist Party (DUP) also called for prosecutions over the funeral itself. The DUP’s Nelson McCausland said it was “clearly in breach of the law”. He also called for an investigation into the volley of shots fired in tribute. The PSNI said they were examining media footage of the funeral.